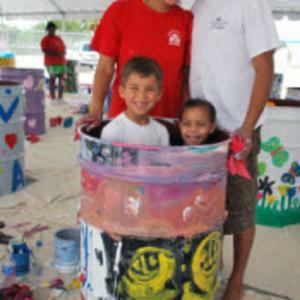 BROWARD COUNTY, FL - Broward County&apos;s Port Everglades is inviting volunteers of all ages and talents to test their creativity and painting skills on Saturday, May 18, 2013, from 9 a.m. until noon in a community service project, Keep Port Everglades Shipshape, to transform recycled petroleum drums into decorative trash and recycling bins that will be used throughout the Port. Tours of Port Everglades will also be available for volunteer painters. This year&apos;s event will take place in a new location in front of Cruise Terminals 22/24. Register with HandsOn Broward at handonbroward.org or contact Port Everglades at 954-468-3509 or porteverglades@broward.org. In its fourth year, "Keep Port Everglades Shipshape" is a port-wide campaign to encourage recycling and cleanliness at one of the world&apos;s leading cruise and cargo seaports, Port Everglades. The event also coincides with National Maritime Day, which is a national celebration to honor and recognize the maritime industry and its benefits to our country. Participants over the age of 18 must present government-issued photo identification, such as a driver&apos;s license or passport, at the entrance gates to Port Everglades. Please wear comfortable clothing that can become stained by paint. Don&apos;t forget sunscreen. More information about Port Everglades, including driving directions, can be found at porteverglades.net.